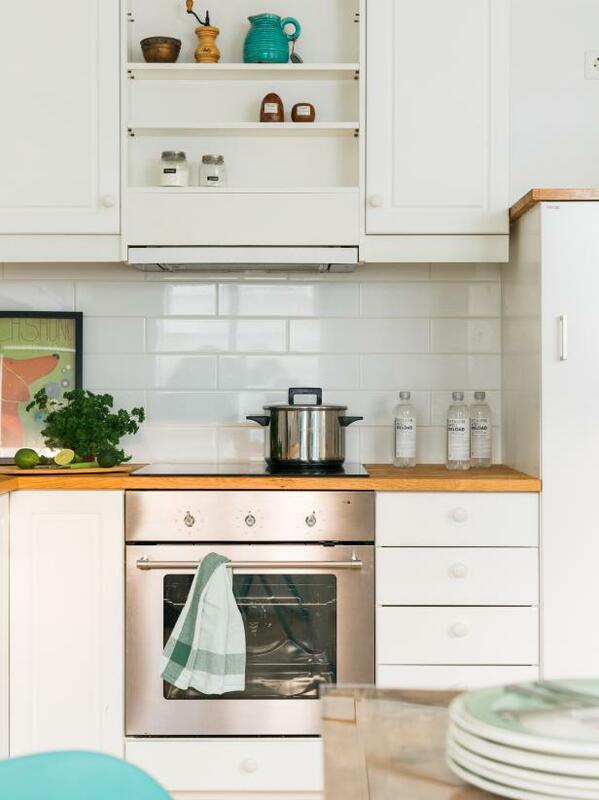 Clean and pristine, this white modern kitchen is the perfect antidote to the busy day-to-day world. 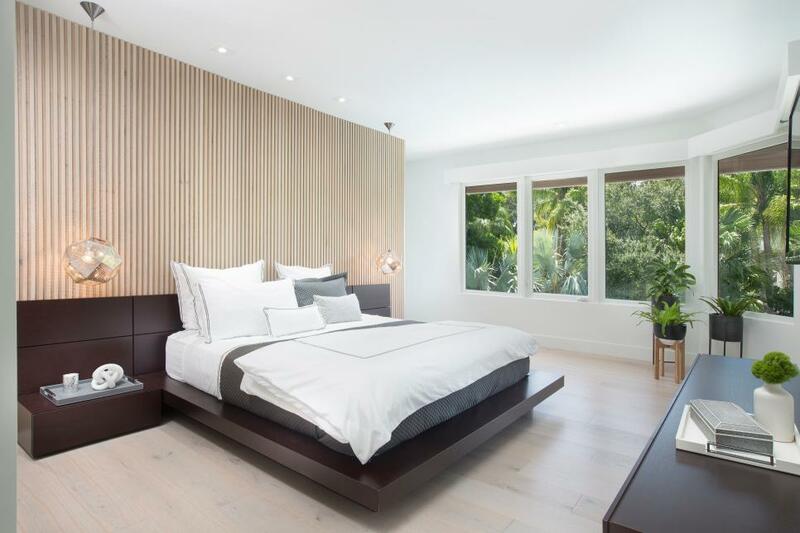 Instead of color, texture adds the visual interest in this chic master bedroom: wood slat paneling behind the bed, wood floors, leafy green houseplants. The simple palette highlights the lush landscape outside the window. This living room features a plum and sage green color scheme and a minimalist approach to decor. 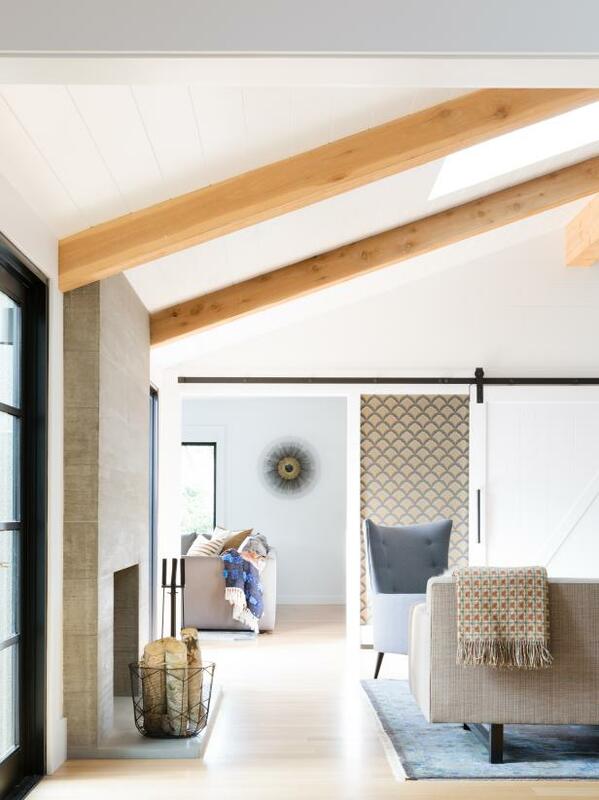 Glass doors, windows and light-colored walls keep the space feeling bright, and a wood-burning stove adds an unexpected touch. Tucked in a cozy little nook is a streamlined white crib with beautiful soft green-and-white wallpaper as the backdrop. Contemporary sconces add light to the space, while floating shelves display favorite stuffed animals. Contemporary yet comfortable furniture creates a relaxing sitting area in this Scandinavian-inspired living room. 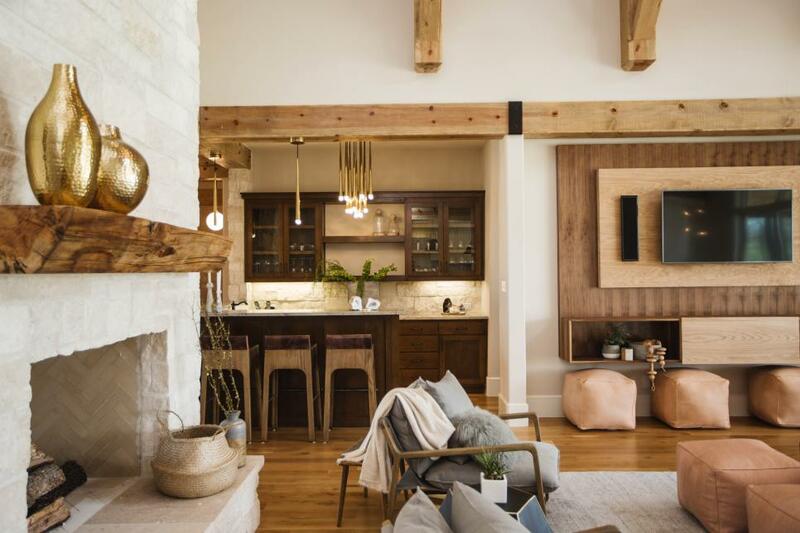 A trio of light fixtures hang from the exposed wood beams, bringing a touch of rustic charm to the space. 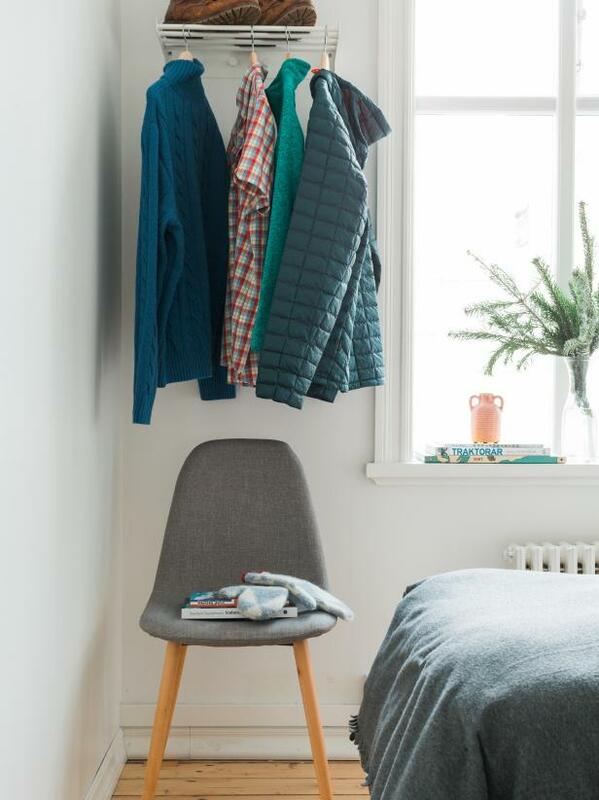 When a space is primarily white and clutter-free, simple everyday objects like a well-made chair or your favorite puffer jackets can become a colorful focal point. Less is more when it comes to Scandi-style so choose what’s out on display carefully and you’ll love the final result. 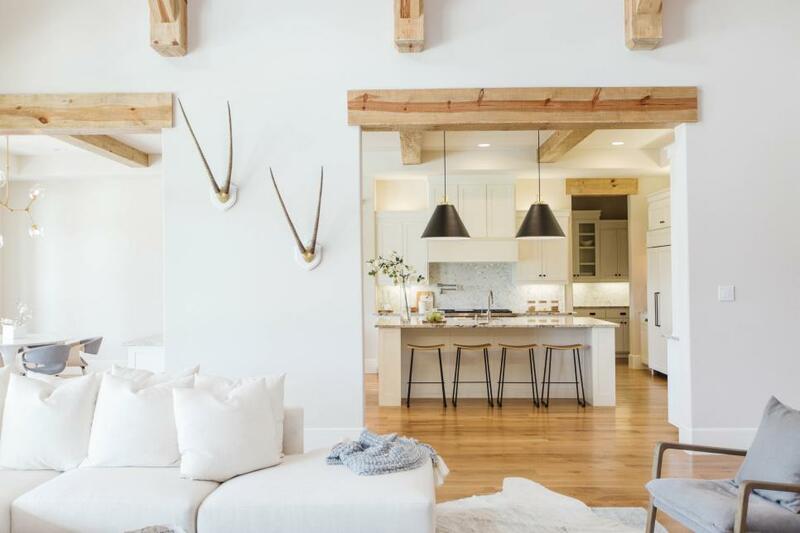 Clean white walls contrast against the exposed natural beams throughout this open floor plan kitchen and living space. Low, comfortable furniture is ideal for gathering and relaxing, while the easy flow throughout the home creates a perfect space for entertaining. 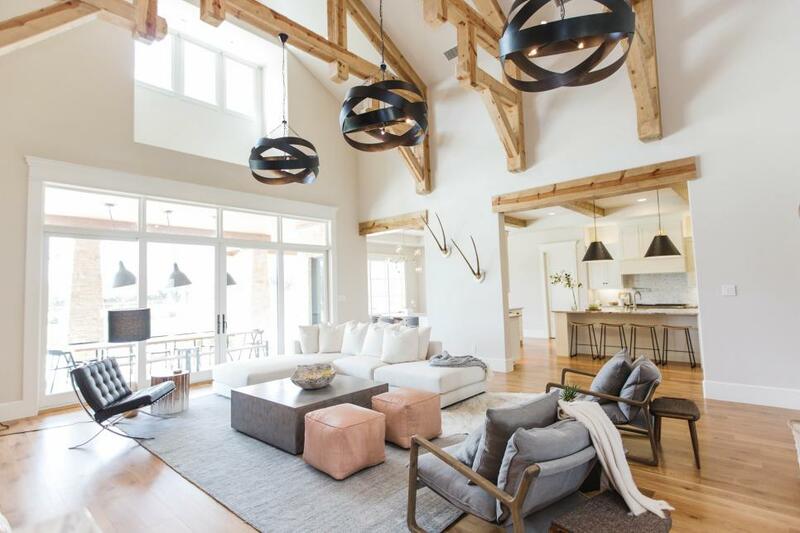 In this white transitional living room, touches like the exposed beams and sliding barn door are charmingly matched with this mountain home's rustic setting. Behind the barn door, graphic wallpaper is a fun reveal. 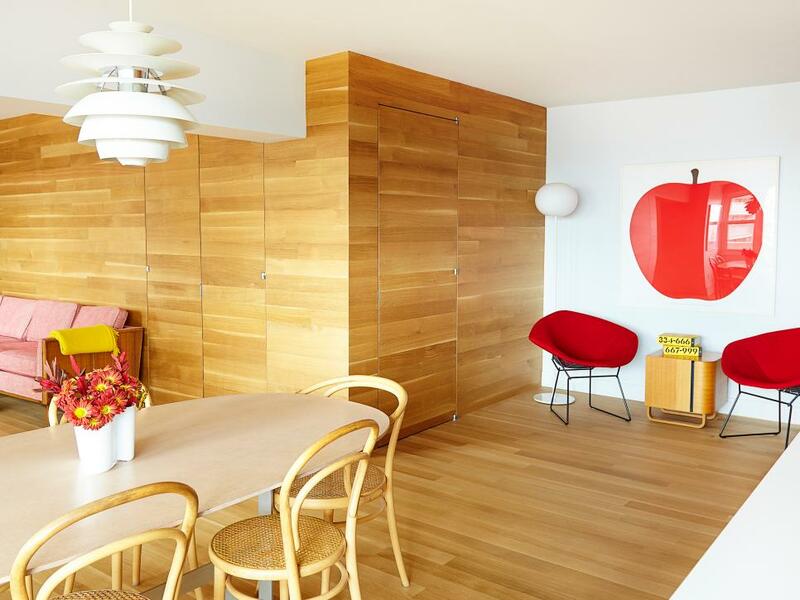 Bright red and pink accents break up this blonde wood-dominated space. 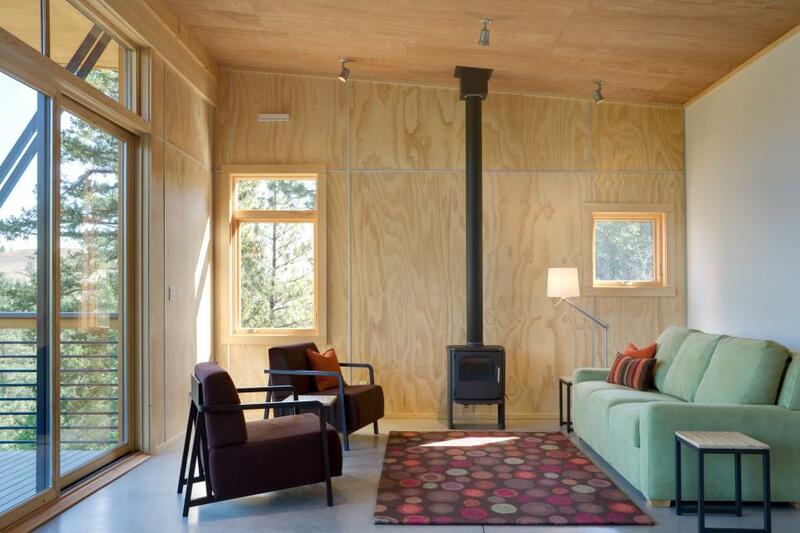 To maximize the space, a hidden door in the wood paneling leads to the enclosed master bedroom. 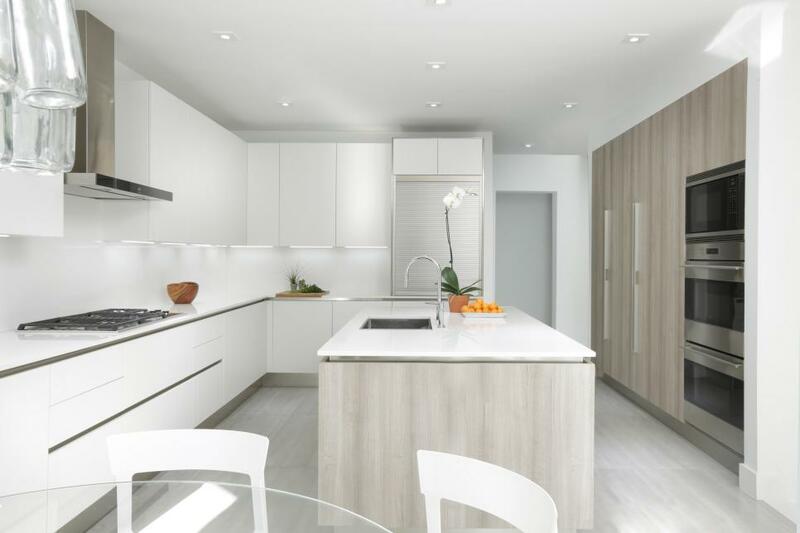 The all-white aesthetic creates a wonderful sense of calm, but that doesn’t mean small doses of high-energy color are unwelcome. It’s just the opposite, actually. Highly saturated color used sparingly always feels a little optimistic when paired to a fresh, crisp white. The white walls in this transitional kitchen are offset by striking blue-gray cabinetry. 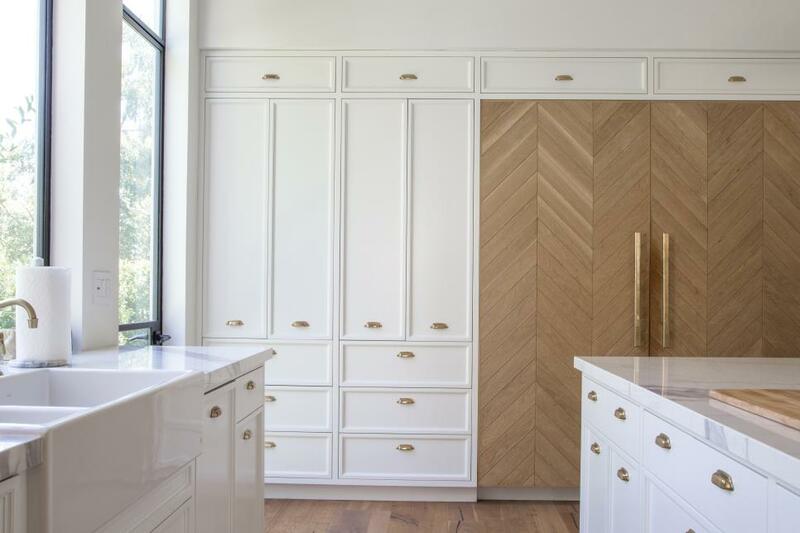 An unpainted wall of cabinets near the island emphasizes the wood grain. 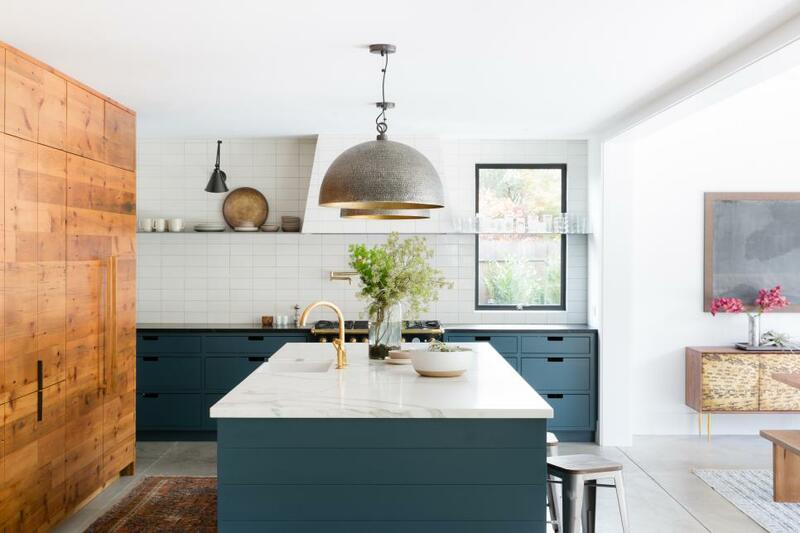 To ensure the white-washed interior of their kitchen didn’t feel overly sterile the homeowners chose wooden countertops. 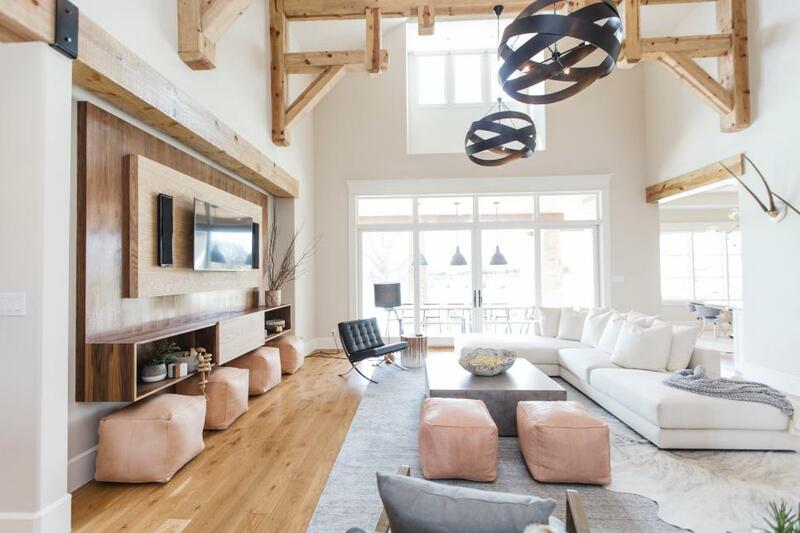 It not only brings in a natural element, but the golden tones of the wood help warm up the space. From: Bryan Wark Designs, Inc.
Often times, getting that chic, edited look you see online and in magazines isn’t as hard as you think. Just don’t overthink small opportunities. 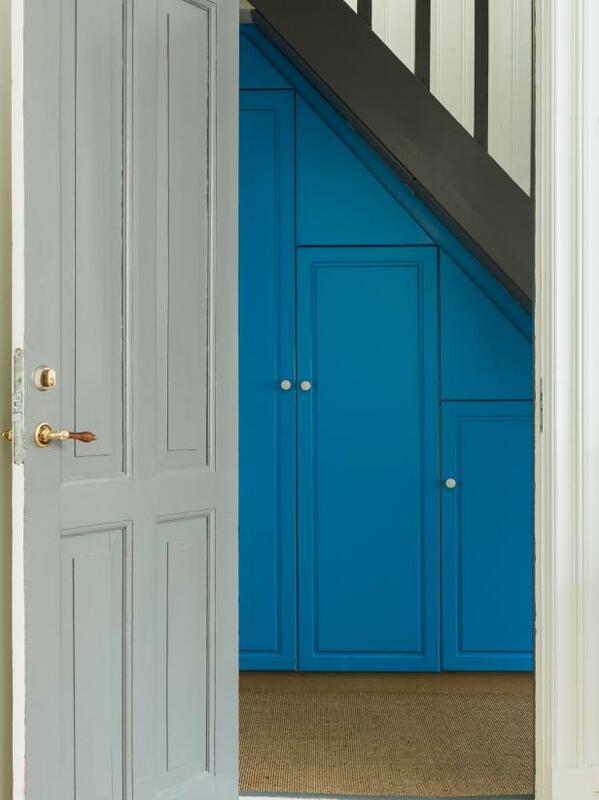 For example, this little niche in the corner of the apartment wasn’t built out into an elaborate cubby system to create extra storage, the homeowner simply added ONE bar and three hooks painted out to match the wall color. 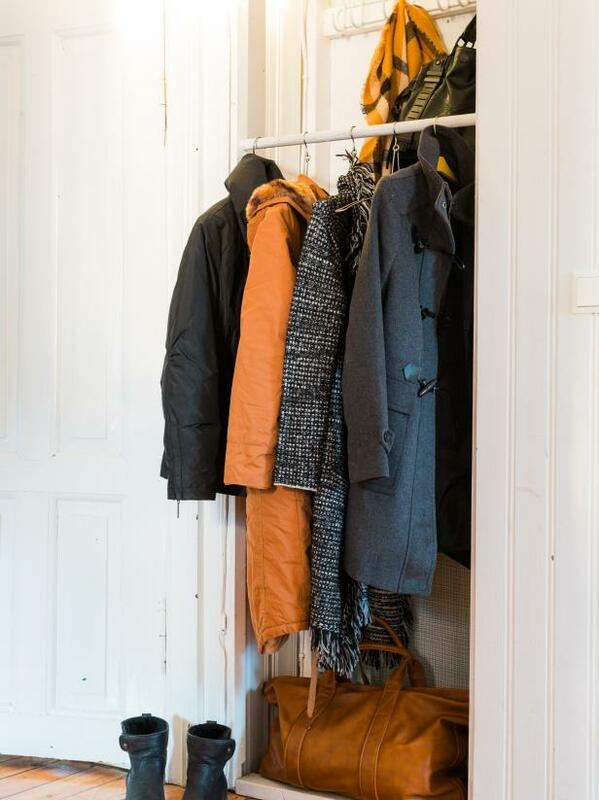 An elegant solution, now the coats and accessories feel like part of the décor. Their beauty and texture really pop in such a pared down environment. This hallway off the master bedroom provides both a view into the large bathroom and a great sense of the owners' style. 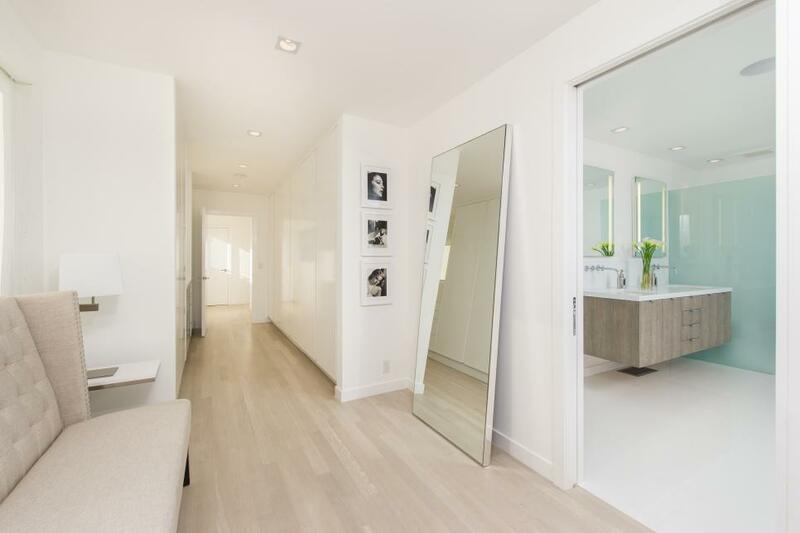 Modern and simple, the space boasts impactful elements such as the large, leaning mirror and the pale wood floors. A touch of turquoise in the bathroom brings a clean, fresh feel. The slanted ceiling in this spa bathroom gets a skylight, letting sunlight filter into the room and bounce off the white ceiling, walls and floor. 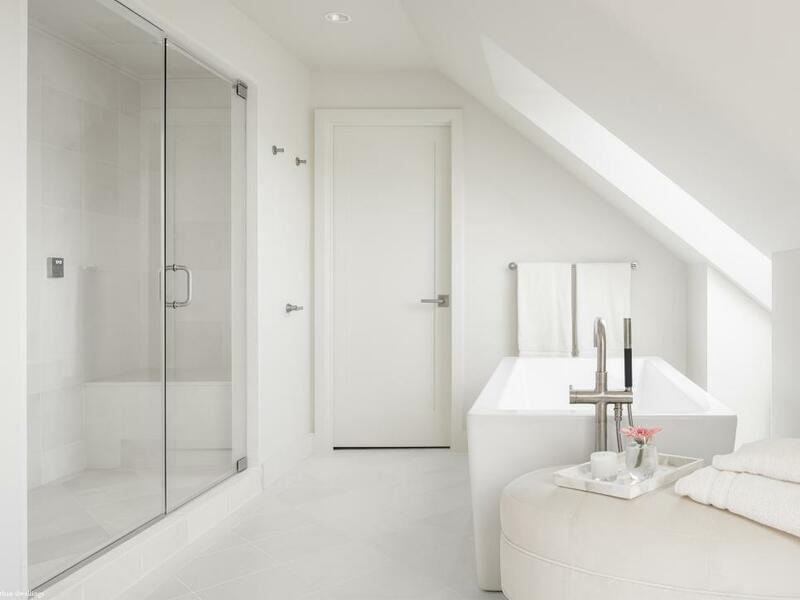 Tucked beneath the skylight, a huge freestanding tub makes for the most relaxing soaks.